Balance bikes are sweeping the world as the best way to teach children to ride bikes. What is a balance bike and how does it work? Balance bikes look a lot like a normal bike with two wheels, frame, seat, and handlebars. What you won’t see on a balance bike a crank, chain or pedals. Balance bikes are designed to teach kids the most difficult portion of riding – Balance. The best way to get kids excited about their balance bike is to make sure it fits them and it’s fun. To adjust the fit, start by loosening the seat and dropping it all the way down. 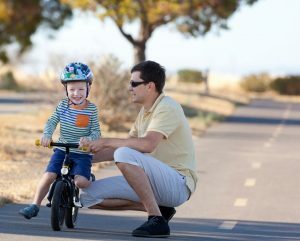 Next, have your child stand over the bike and lift the saddle until it makes contact with their backside. Tighten the seat at that height. Once the seat height is set, adjust the handlebars to a comfortable position for your child. They should be able to reach out normally and hold the grips. If they look as if their arms are too high (this will fatigue them prematurely) lower the bars. Inversely, if the child is reaching too far down, raise them. So once the bike is fit right, be sure to make it fun! In short, make sure the bike is what the child wants it to be. Stickers, colored tape, bags, bells or horns work great to customize your child’s balance bike for them. A balance bike is a bike and should be treated as such. This means you want to practice in a flat safe area free of traffic, wear a helmet and be careful of obstacles. Starting out on the balance bike can be intimidating for your kids. Try to keep it fun. Kids love motorcycle sounds and wheelies. In my 15 years working in a bike shop, I never once ran into a kid who didn’t like getting pushed around on a bike while making motorcycle noises. If you can add a wheelie to the mix, all the better. Even if the first rides aren’t very long, be sure to stop as soon as it’s not fun. 5 to 10-minute rides may seem short but are totally acceptable. While helping your child with their balance bike, remember that the goal is for your children to understand how to balance WITH the bike. This is different from balancing ON TOP of the bike. A great way to help this is to support the children by the shoulders rather than holding the seat and handlebars. If you support the child, they will learn to use the bike to help them balance. If you hold the bike stable, the kids have more trouble feeling what real bicycle balance is. All our talk about balance makes it sound like pedals at the young age are a bad thing, That’s not the case. Bikes with training wheels or tricycles have a great place in teaching kids how to pedal. The action of pedaling forward is not as difficult to learn as balance, but the frustration of not being able to do it can hamper a child’s move from balance bike to pedal bike. Balance bikes come in many different sizes. The smallest sizes can accommodate kids as young as 18 months. Before picking a balance bike, have the child stand over it. You want some clearance between the child and the bike, and a comfortable distance from the seat to handlebars. Most Balance bikes will top out sizes for kids around 6. In a few stories, you will hear about the kid who got off his balance bike, mounted his new pedal bike, and pedaled away. It’s a great story, but not too common. Transitioning to a pedal bike takes a little effort. Start in a similar fashion to the balance bike – Fit and Fun. Adjust the pedal bike’s seat and handlebar. Next step is to explain how the bikes brakes work. With a balance bike kids can become accustomed to stopping by dragging their feet, so it’s important to show them how the pedal bike stops. Next step is to let them ride while supporting them by the shoulders and let them pedal around. Once they feel comfortable pedaling, you can let go. You will find they have almost no issues riding and the transition from balance to a pedal bike will happen within a day. After all this, you’re probably asking yourself “Why can’t I just pull the pedals of my child’s bike and use that as the balance bike?” The truth is, you can do that. 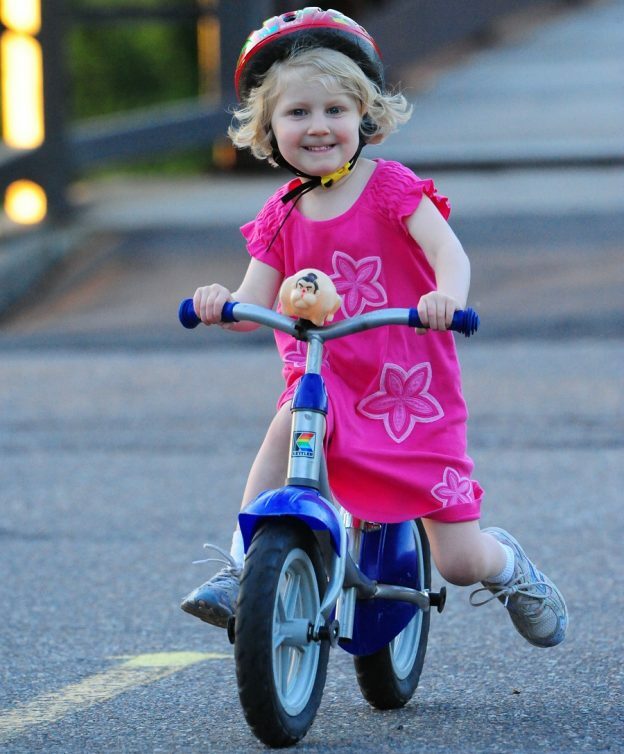 Pulling the pedals off a bike will give you a lot of the same benefits as a balance bike. The shortcomings of doing that are pedal bikes are wider than balance bikes and make it more difficult for the child to push off. Pedal bikes are also heavier than balance bikes. Pushing around the extra weight of a pedal bike can be difficult for smaller riders. However, you choose to teach your kids to balance, keep it fun. 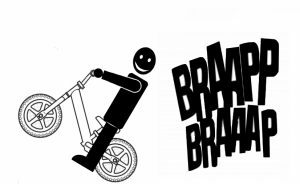 This entry was posted in News and tagged balance bike, Balance Bikes, ballance bikes, childrens bike, childrens bikes, chldrens bikes, family fun bike memories, family fun bike ride, kid bike, kids bike, kids bikes, strider on February 21, 2019 by John Brown.